Thomson Creek Farm: Can't I just throw away this rough draft? I have attempted to write a little fiction this week. If I see myself as a writer at all, it would be for sure in the non-fiction genre. I actually started my novel before I began taking my writing class but had got about a paragraph down before I gave up. As of today I have 4 pages (double spaced.) It isn't much but it is enough to take to my critique class tonight. I am sure I have been putting them all asleep with my non-fiction articles. I also attempted a whole-wheat pie crust. As I was experimenting with it, I thought of all of the horrible things I have baked over the years and how my skills have improved. 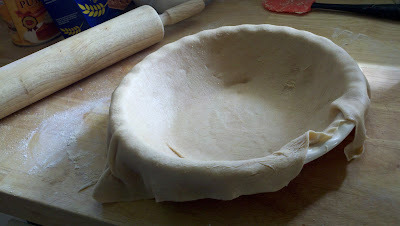 Unfortunately my whole-wheat pie crust wasn't a great example of those skills. It sure looks good though before it baked hu? I can throw away a bad novel and start again. I can throw away a burnt pie crust and start again. Have you ever had a day were you just wanted to crumple yourself up, make that three-point shot into the nearby garbage can and move on? Some days I desperately want to do just that. I know, I know Anne Shirley says, "Isn't it nice to think that tomorrow is a new day with no mistakes in it yet?" but there are just those days that keep reminding you that those mistakes are real. I try to change--honestly I do but sometimes those changes aren't as easy and making that three-point shot. There are those mistakes that I have repented of and moved on, that seem to crop up in my mind and work to convince me that I am really a bad person. What do you do to get those mistakes out of your head? Then there are the mistakes or habits that seem like a life long quest to change. I won't go into detail but mine are many, and daunting. Some days I just want to start over with a custom built me. I want to walk around the showroom and pick out the features that would deliver me from myself. I would load up on more patience, self-mastery, and a whole heap of rational decision making. If I could pick up an improved body and some extra hours for the day I would be set. Some days I feel like this rough draft is just not cutting it. I am reminded though that a rough draft is just that. It is meant to be refined and edits can be painful. That is what this life is about right? Keep on going and trying to get it right?